This challenge is really speeding along! I am about half way into making my dress for #SewTallAndCreative2017 hosted by MARGE and Tall Guides. I am making my dress out of the gorgeous dotty silk over the peach satin. In my last post I was still tossing around design ideas but I really love the 2 fabrics together. My design is still changing and evolving as I sew, which is such a fun part of the creative process. 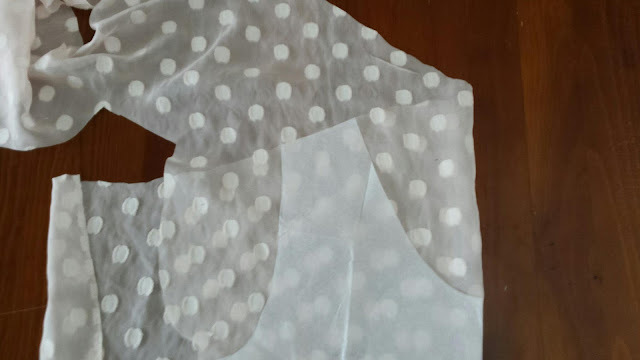 Typically I would advise someone to make a muslin of their design (a mock up in cheap fabric), which I haven't done in this case. We don't always follow our own good advice, do we?! However, by working with the fabrics as I go I feel a little more free to make changes based on how they hang on my body. Thus far, I have used French Seams in the satin to give a beautiful finish. For those who don't sew (yet!) they are essentially seams which double over on themselves. They're twice as much work but well worth it! 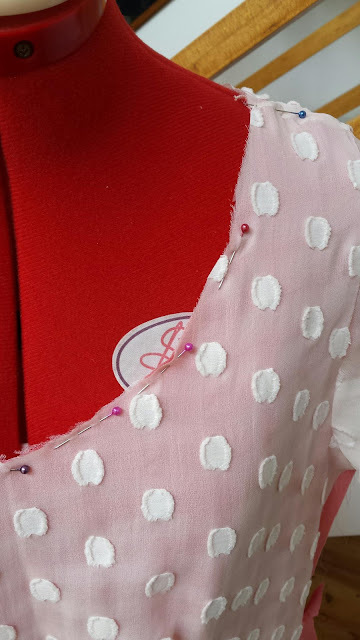 I am finding sewing the silk (dotty fabric) a massive challenge. Working with this fabric is far out of my comfort zone and really testing my sewing skills. It's great that this competition is really stretching both my creativity and skill, I just hope it doesn't turn out to be a hot mess! The bodice of my dress is very simple. It's based on a pattern I've used a couple of times before (see here) so I know I don't need to make major changes as I don't have a large bust or very long torso...all my extra length is from the waist down! For the skirt of my dress I've gone with as much fullness as the fabric I had on hand would allow. I'm still tossing around ideas of how I'll really show off the beautiful satin underneath the silk layer. I am not usually an indecisive person AT ALL but there are just so many options I'm not sure which is the best to go with! The final reveal of my dress will be 20th May, so stay tuned! Happy sewing & wish me luck! The silk is just gorgeous over the peach satin. I'm being careful & using lots of pins, something I rarely do! 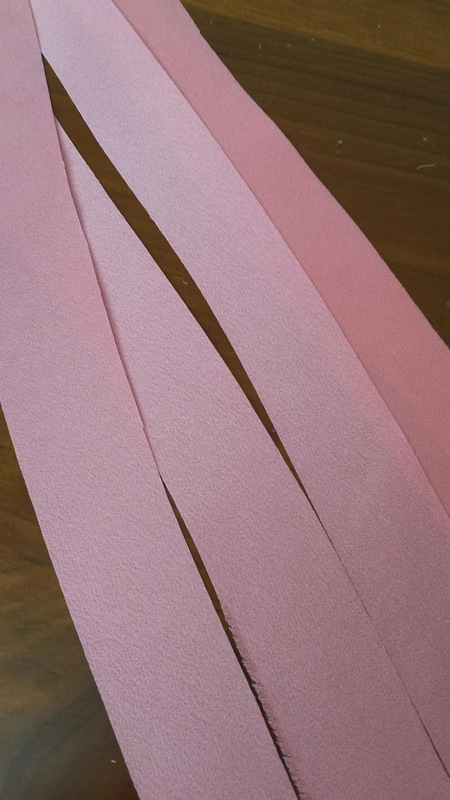 These strips will be ironed into bias binding, which may be used around the neckline. Talk about cutting it close!! I had only a tiny handful of scraps left after cutting the silk. There is NO room for error here people!! I'm just going to sit here and click refresh until the big reveal post is live. :) Can't wait to see the finished product.